The short answer is its like a 'complicated' retrieve. Your dog has to find and bring back to you a cloth with a scent on it ignoring other cloths (some with no scent on them, some with 'other' peoples scent on them - depending on class level). See below for details of different scents for different class levels. All this in a public area, in a marked out ring area. For all Class Levels .. The Scent exercise begins with the dog facing AWAY from the scent area. Both you and the dog can have backs to the cloth area, ie dog sitting beside you) - you will be directed by the ring steward to the starting position and they will wait for you to set your dog up (see photo example below left). The dog is to be facing away from the cloth area while a scented cloth is put out, then (upon steward command) dog is turned to sit at your left side and you 'give' them the scent to match the one to find (see individual class info below on 'giving' scent), then (upon steward command) you instruct the dog to search for the scented cloth and the dog should return to sit in front of you holding the cloth, then (upon steward command) you take the cloth from your dog (dog still sitting), then (upon steward command) you ask the dog to sit beside your left leg. 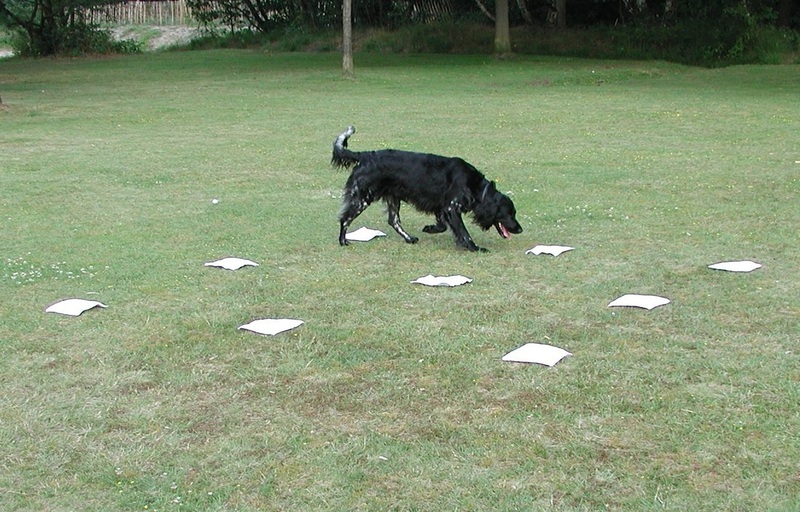 Ring Steward instructions will be very similar to the Retrieve exercise, except that the dog starts facing away from the scent area. So you will receive an instruction to turn your dog to face the area sitting at your left side. Blank cloths should be almost clinically clean, untouched cloths with hopefully no smell or scent on them at all. All Blank cloths are supplied by the Show Management and are therefore all prepared the same. Dog needs to find the cloth you have put your own scent on. In Class A there will be a total of 6 cloths: your scented cloth plus 5 clean, untouched 'blank' cloths. The pattern must only be a straight line in any direction. In Class A you can only use a simultaneous command and signal (including dogs name if you wish) at the start of the exercise. You will take a cloth from the ringside table when told and enter the ring carrying that cloth. Whilst carrying cloth in you can handle it and ensure you have put your scent all over it to the amount suitable for your dog - you cannot offer it to the dog nor can you throw it on the ground or allow the dog to pick it up from the ground. During the test you can only use a simultaneous command and signal (including dogs name if you wish) at the start of the exercise. You will be directed where to set up by the ring steward (you still have the scented cloth at this stage). You set up with your dog facing AWAY from the cloth scent area. Once you have finished putting your scent on the cloth then you offer that cloth to the ring steward. They will take it and place it in the scent cloth pattern. You dog must still be facing AWAY from the area. Then you can 'give your dog your scent' via your hand - you hold your hand around the dogs nose area (not too tight/close - allow the dog to take in air). Once cloth is placed the steward will return and tell you to face the area, so you and your dog end up facing the area with dog on your usual left side (sitting). Then you can if you wish 'give your dog your scent' via your hand again. You will usually be bending to do this, and so once you stand up straight again and remove your hand from the dogs nose, then the steward will assume you are ready and will command you to send your dog out to do the scent. Your dog is then to go into the area with the cloths and find, pick up and carry your cloth back to you and then sit in the 'present' position, still holding the cloth. The steward will command you to take the cloth, and then commands you to move the dog into the 'finish' position. Decoy cloths are cloths that are handled (scented) by chosen/volunteer people (Decoy Stewards). Decoy stewards will handle the cloth for no longer than the handler in class B or the judge in class C.
The Decoy steward places their own cloth in the judges pattern. Each dog has an individual freshly decoyed cloth. The Decoy Steward usually sits on a chair in the ring during the scent exercise. All Decoy cloths are supplied by the Show Management prior to being scented by the decoy and are therefore all prepared the same. In Class B there will be a total of 6 to 10 cloths: your scented cloth plus 1 decoy cloth then the rest must be clean, untouched 'blank' cloths. The dog needs to chose YOUR cloth from 1 other scent and unscented blank cloths. The pattern is any layout at judges choice. In Class B you can only use a single command OR signal (including dogs name if you wish) at the start of the exercise. You cannot touch your dog during the exercise in any class level. All other details for giving scent and ring stewarding are as per Class A. Class C & Championship C Scent ..
Dog needs to find the cloth with the JUDGES scent. There will be a total of 6 to 10 cloths. The cloths include the judges scent, plus 1 or two decoy steward cloth(s) then the rest must be clean, untouched 'blank' cloths. The decoy stewards (up to 2 of them) could if requested by the judge scent 1 OR 2 cloths each. So in Class C & Championship C you could potentially have anything from 1 to 4 'decoy' cloths, the judges cloth plus the other blank cloths. The dog needs to chose the JUDGES cloth from all other decoy scents and unscented blank cloths. The judge will scent up two cloths at the same time. One will be placed out in the scent pattern the other will be given to you for the dog to 'take scent' from. You will be directed to the starting position. You face away from the cloth pattern as per other classes. You will be offered a scented up cloth by the judge once their other cloth has been placed in the pattern. They will ask you if you want the cloth where you are OR if you want it after you have turned - its your choice. Whilst facing away you can if you wish offer the dog the judges scented cloth, which can (if you wish) be continuously held over the dogs nose until you have turned to face the scent area and stood up straight. You can only take the cloth once you have turned the dog to face the scent pattern, then the judge will hand you the cloth and you can give scent, again once you are upright it is assumed you are ready to be instructed to send the dog out. During the test you can only use a single command OR signal (including dogs name if you wish) at the start of the exercise. All other details for ring stewarding are as per Class A. What you Might Lose Points for During the Scent ..